Race to the rescue in the Lights and Sounds Fire Engine! This 1:20 scale vehicle is perfect for imaginative play. The Lights and Sounds Fire Engine has everything kids need to imagine putting out fires, rescuing cats from trees, and much more. Bring the scene of the emergency to life with realistic lights and sounds, just like a real-life fire engine. The extendable ladder of the Lights and Sounds Fire Engine rotates 360 degrees, so no rescue is ever out of reach. With friction powered wheels suitable for play on various surfaces, this fire engine lets kids race to the scene of the fire in no time. Learning about the work done by others in the community is an important part of childhood. With the Lights and Sounds Fire Engine, kids can discover the exciting world of fire fighters and first responders. This vehicle has a bright red body and cool decals to bring rescue adventures to life. This fire engine is sure to provide your child with endless hours of fire rescue fun. 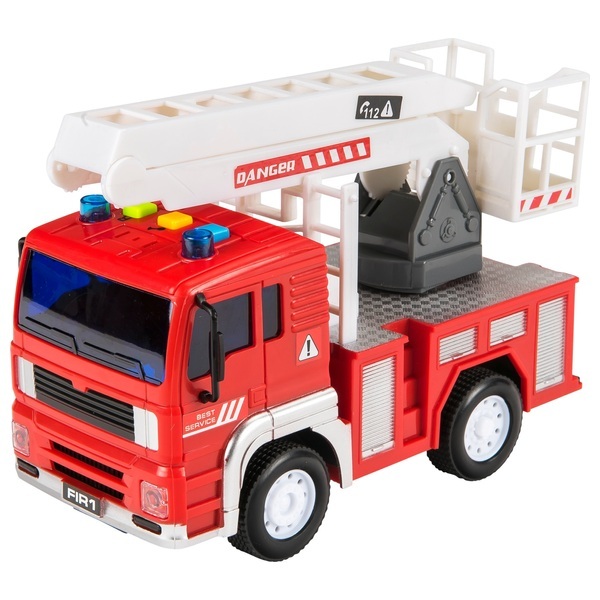 The Lighs and Sounds Fire Engine features a fully extendable ladder, buttons for lights and sounds, and friction powered wheels.